The formation community of Marist College, Suva, led by Fr Donato Kivi sm, Fr Jacob Aba sm, and Br John Votaia sm continued enthusiastically, as a community, to respond to the call to ecological conversion by Pope Francis in Laudato Si. 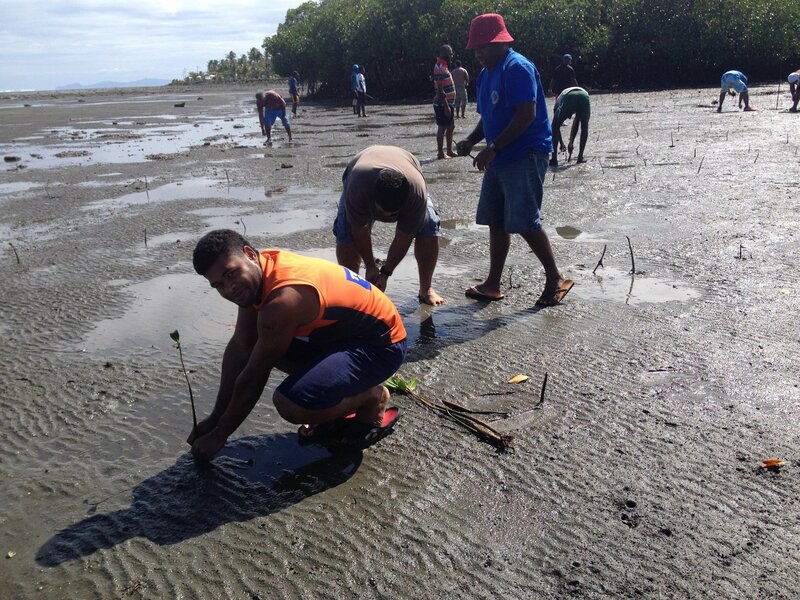 The community has managed to plant 600 mangrove seedlings in the seashore adjacent to the Seminary. This is in addition to their current engagements in composting, permaculture and using soil as building materials. Marist College is leading the way for all the Marist communities in the Province to actively follow. It was a call for each confrere and each community by the Council of the Province 2018 to take leadership roles in caring for our common home. The ecological conversion takes place, first and foremost, in the personal level, but there must also be conversion in the community level in order for any effects to be felt. The outgoing Apostolic Nuncio for New Zealand and the Pacific, Archbishop Martin Krebs, together with Archibishop Peter Loy Chong, and Bishop Ghillain Rassily sm of Wallis and Futuna, opened the 2018 Assembly of the Confrence of the Major Superiors of the Pacific Islands (CMSPI) with the Eucharist on Tuesday 7th August. 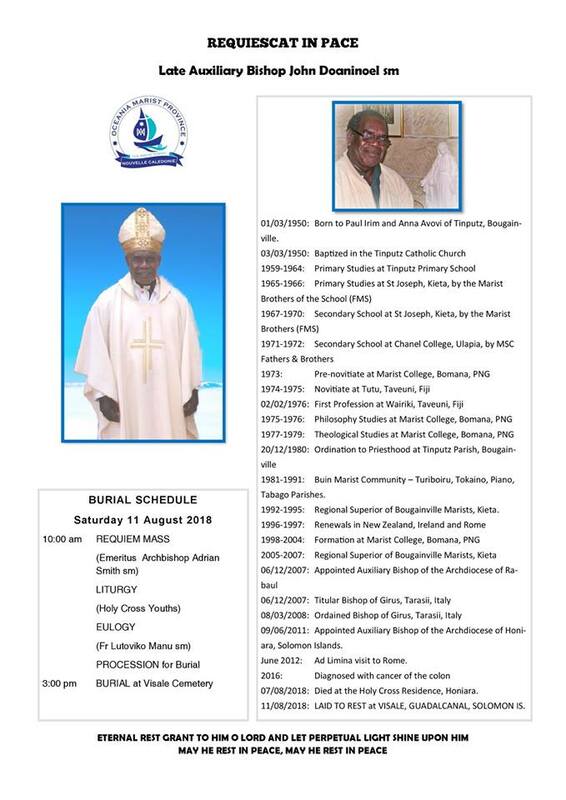 The Assembly was held in the Pacific Regional Seminary, Suva, for 3 days. The THEME was a continuation of the 2017 theme: LAUDATO SI, CARE FOR CREATION. 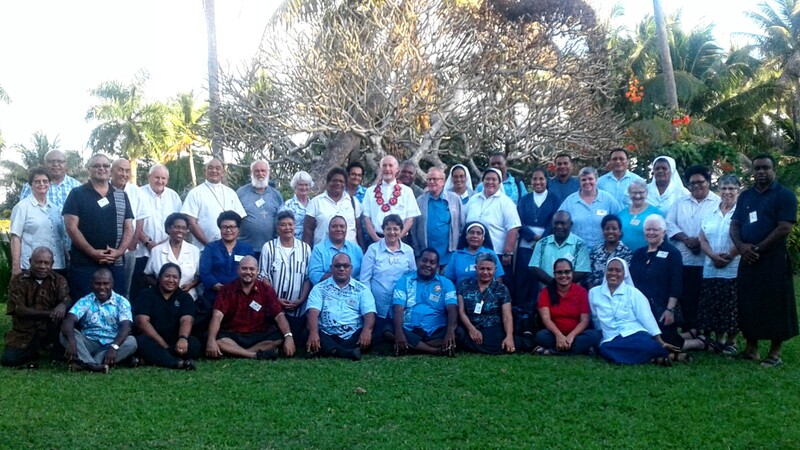 Archbishop Peter Loy of the Archdiocese of Suva together with the Professor of Marine Studies in the University of the South Pacific, Dr Joeli Veitayaki, and Fr Dr Donato Kivi sm of Marist College, were the main facilitators. The resounding message: CARING FOR OUR COMMON HOME IS URGENT. The awareness time is done. Now is the time to ACT. Challenges were laid down and taken up to announce it in religious communities lifestyle, in taking up active leadership roles in caring for our common home in parishes, schools, families, and places of ministries. CMSPI was further challenged to be Voices in denouncing injustices and unjust systems that are contributing to the current ecological crisis. The Apostolic Nuncio was also farewelled by CMSPI as he leaves to take up his new post in Uruguay. CMSPI OPENING EUCHARIST: Archbishop Peter Chong, Archbishop Martin Krebs (Nuncio), Bishop Ghillain de Rasilly. CMSPI participants singing the Fijian farewell song "ISA LEI" for the Nuncio, Archbishop Martin Krebs. Dr Joeli Veitayaki leading the replanting of the Mangrove and the cleaning of rubbish in the seafront of PRS. Fr Dr Donato Kivi sm showing to the CMSPI participants what they can do in response to the ecological crisis through permaculture, composting and building using soil only. Bishop Ghillain and Vicar Provincial, Milikiade Rayalu collecting their share of the rubbishes. Fr Donato explaining the process of permaculture. Sr Patiola Molia soln, secretary of CMSPI adding her bit to the clean-up. Bishop Ghillain with some of the CMSPI participants resting after a good morning's work. The Fijian participants in CMSPI performing an item for the rest.